"I would definitely rate this company very highly. The customer service department was almost immediate in its response to my order, and then there were follow-ups letting me know immediately when it would be shipped. It actually arrived at my home before the date assigned for arrival, and the BEST THING is that everyone who has received the cakes as a gift absolutely loves them!" We have just the right cake to make any occasion, extra special. Choose from over 80 irresistible gourmet cakes, including scrumptious chocolate coffee cakes for those chocolate lovers on your list. Celebrate the tradition of Coffee Time, Tea Time and Any Time from our elaborate dessert menu. 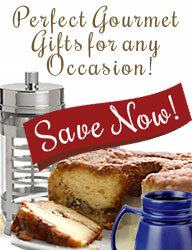 Read more about coffee cakes in What is the definition of Coffee Cake and Coffee Cake Traditions.